Think Paris, think pâtisserie. Few visitors can resist the buttery crumbs of a croissant, the sweet tang of strawberry tart or the sugary puff of a chouquette. But of all the treats lining the pâtisserie wall, the macaron is the fairest of them all. Said to have been the preferred treat of Louis XIV, this brightly-coloured morsel still inspires reverence in the court of Paris foodies. It matters little whether you swoon for Ladurée’s offerings on the Champs Elysées or prefer Pierre Hermé’s creations south of the Seine; once you’ve tasted a good macaron a pleasant addiction is only a matter of time. Jill Colonna knows all about the bewitching power of macarons, describing her first encounter as ‘Love at first sight.’ Originally from Scotland and now based in Paris, Jill tried her hand at macarons during a two hour workshop at her local pâtisserie. She then impressed her French neighbours at dinner parties and – inspired by their rave reviews – approached Waverley Books in Scotland. 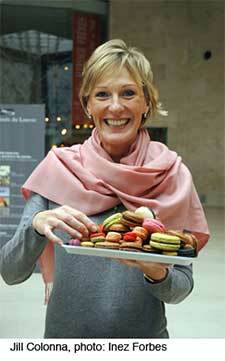 Her aptly-named recipe book – ‘Mad About Macarons’ – was published in September 2010. Jill exudes enthusiasm about her subject, stressing in particular the therapeutic qualities of macaron-making. ‘I like to see people happy when they eat them,’ says Jill, ‘but I get just as much enjoyment making them. Making macarons is a form of yoga, it’s just wonderful!’ Now some might quibble with the idea of yogic macaron-making because to the lay baker these beautiful airy bites seem very high maintenance. The egg whites must be ‘aged’ for four days, then there’s all that piping them onto baking sheets, baking, cooling, ganache-making, (stay with me) sticking them together and leaving them to dry for 24 hours. Yet Jill’s book cuts through the fear with straightforward explanations and an enthusiastic style. She demystifies Parisian pâtisserie chic and makes it seem attainable. Which is not bad going for a lass from Scotland. So when your visit to Paris is a distant memory and the taste of macarons has long since faded from your tongue, you can recreate the magic at home with Jill’s book. Play it safe with traditional rose flavour, or walk on the wild side with Bloody Mary macs or Thai Green Curry. Just don’t tell Mr Hermé or the good people at Ladurée. ‘Mad About Macarons’ is available in Paris at Galéries Lafayette, WHSmith Paris, La Librairie Gourmande or Le Bon Marché.